This car has been narrowed down to one of the last 12 built – the South African factory wasn't too meticulous with its record-keeping, apparently. What can be confirmed is that the last ever was painted anthracite grey. After the owner's death the car stood in dehumidified storage from about 1987 until last year, when the family approached marque specialist Mark Cosovich of W123 World because they were concerned about this unique vehicle's final ownership, preferring it to go somewhere where the family's cherished ownership would be appreciated. It's now a "trailer queen" for display (the car has been on show at the Mercedes-Benz World showroom at Brooklands) and as a template for the company's other restorations of W123 models. What's the difference between this and any other lovingly restored classic car? For starters, it's not been restored, merely recommissioned after standing idle for so long. 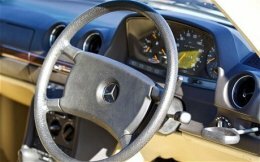 All that W123 World has done is replace all the brake lines and calipers, the entire fuel system including the tank, the exhaust system and the air-conditioning. The car was also treated to some wax underseal, which was never used on South African-built cars. The rest is totally, utterly original and even the Mercedes-Benz museum in Stuttgart has told Cosovich that it doesn't have a W123 to this standard. And its value? Cosovich is guarded, saying only that a 300D (diesel) W123 taxi was sold in Germany for about £35, 000 recently. "This 230E is a much higher spec and more costly vehicle, also the last known built survivor, so its unique position makes it considerably more collectable, " he says. "No matter how well restored, no one can replicate the history and special feel of a factory-fresh Mercedes-Benz from this period." This example has nearly every factory fitted extra, such as air-conditioning (still a luxury in 1986), full leather interior, factory sump guard, tow hitch and heat resistant glass. 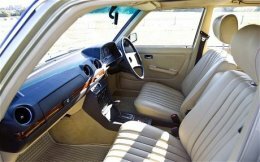 According to Cosovich, South African-built cars had 40 per cent local content, with superior wool carpets and leather interiors and better sound deadening. The engines were also bench-tested, so in many respects they were superior to the German-built cars. These big Mercedes always used to look huge from the back of my father's Morris, although these days it looks positively compact. There's plenty of space once inside, however, the interior's old-fashioned layout and narrow pillars reinforcing the feeling of spaciousness. The seats are comfortably upholstered, the steering wheel massive and the forward view dominated by the three-pointed star on the leading edge of a long bonnet reminding you – and bystanders – of your status. It's uncanny. The original pedals are pristine. Ahead are lovely simple gauges, the large central speedometer flanked by a revcounter on the right (it's redlined at 6, 000rpm but there's little point in pushing it that far) and a collection of oil and economy gauges to the left. The 230E starts on the button and the immediate impression is of how smooth it is. The automatic transmission is perfectly suited, too. There's not a great deal of power from the 2.3-litre engine, with just 134bhp on tap, but it really does feel unburstable. For the record, the official figures are 0-60mph in 12.3sec and a top speed of 109mph. Approaching a corner, the initial body roll is alarming but while it's no sports car the Mercedes is sure-footed. The bodyshell is high tensile steel but it's not that heavy. "Take the engine and interior out and you could push one for miles, " says Cosovich. Indeed, at about 1.3 tons it's a relative lightweight by modern standards. It's not particularly keen to turn in, either, but it's very Mercedes, upright and sober as befits the generally well-heeled . It really does feel as though you could cover many hundreds of miles in one sitting, especially on long, sun-baked South African roads. Unfortunately, we were on the tight test circuit at Mercedes-Benz World, not its ideal habitat. In fact it's as smooth as any modern car, with possibly even better ride comfort because of the soft suspension. 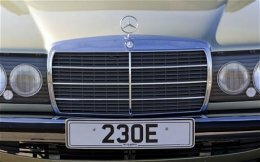 The W123 is not the most exciting of cars, perhaps, certainly not up there with revered machines such as Blower Bentleys and Ferrari 250 GTOs, but the fact is it remains highly sought-after by modern drivers who demand an utterly dependable car – often fuelled by fond memories of a father's or uncle's Mercedes. 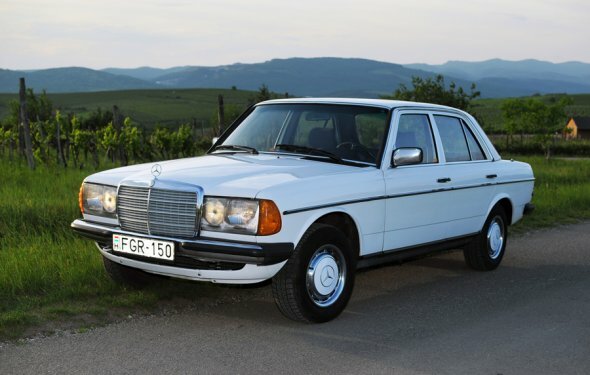 It's also worth noting that it's also prized by thieves – W123s are often stolen and, presumably, spirited away to Africa where their status is second to none. None of which takes away from this unique, as-new example, which is utterly beguiling and an absolute pleasure to have driven. You're visiting Through Hole service on our website.